But just by getting there he had won against the odds – and his team had snatched a seemingly impossible victory in the game of glorious uncertainties. “Sitting in my refugee camp in Peshawar I watched Pakistan win the 1992 World Cup. That’s when I first got interested in cricket,” reminisces the former captain of the Afghan national team. From tennis-ball cricket in the dusty Kachhi Garhi refugee quarters to the highest level of the game in St Lucia’s picturesque stadium – it’s a story true to the romance of the sport. A story that Raees Ahmedzai hopes will inspire Afghanistan’s next generation of cricketers – and bring together this ethnically fractious country. He has retired from the game since returning from the World Cup and now wants to concentrate on coaching aspiring Afghan cricketers. Aided by the Marylebone Cricket Club (MCC) among others, Mr Ahmedzai has held training camps in several provinces including Wardak, Khost and Logar. In a park in Kabul’s Shar-e-Naw area, the scene of a Taliban suicide attack that killed 17 people in late February, most groups of young boys are busy playing football which remains a more popular game. But there are some kids with cricket bats and rubber balls fussing over which tree should demarcate their boundary. “I saw Afghanistan playing cricket on TV for the first time in this World Cup. It was great… but I wish we had beaten India or South Africa,” says 11-year-old Fahad. “I want to bat like Noor Ali,” says Tareq, aged 13. His idol’s fluent half-century against India has made him a star among these children. “And I want my own cricket bat,” he says. The cricket boom is also visible in one of Kabul’s biggest sports goods shops. “We used to sell one cricket bat per day on an average before the World Cup. But now we sell about three or four a day. Customers also want better quality cricket gear these days,” says Saif Khattar who works in the store. In what could mark a turning-point, 24 out of Afghanistan’s 34 provinces are now playing the country’s first inter-provincial 50-over tournament. But even as the top cricketers fight it out on a turf pitch in Kabul, there is a battle brewing off it. For the last six months the players have refused to sign a new contract offered by the Afghanistan Cricket Board (ACB) who are offering a salary between $400 to $700 a month based on seniority. “It’s just not enough,” says Nawroz Mangal, the captain of the World Cup team. The players are demanding $1,500 a month in salary and a larger share of the sponsorship money from telecom group Etisalat. While this may seem small change for international cricketers, the ACB says it would be a huge burden. The players are now negotiating with the ACB chairman and Afghan Finance Minister, Hazrat Omar Zakhilwal, to settle the dispute. 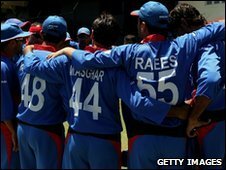 For Afghan cricket to consolidate its World Cup success, the players and administrators will need to work together. Next on the itinerary of the national team is the ICC World Cricket League Division One matches in the Netherlands, where they will lock horns with other countries ranked just below the elite test-playing nations. Quality grounds in Jalalabad and Kabul are high on the cricket board’s agenda, along with academies for youngsters in the provinces. Thanks to their World Cup prominence, international donors and sponsors are now beginning to chip in. “We have a lot of natural talent. If we are given proper grounds, we will reach the World Cup semi-finals by 2020,” predicts Raees Ahmedzai. If and when they do, Mr Ahmedzai and his teammates will perhaps be remembered as cricketing pioneers. My name is Ghamai and I live in US. I am making this statement in order to make a possible difference by at least given my ideas regarding the cricket game in Afghanistan. What we need is not onley to build international cricket staduims in the country, but much important is to provide many small budget cricket grounds in the country. These less amount of cricket grounds in the country will provide apportunities for those cricket lovers who wants to become heroes in the future, can give us some fantastic talents,and would boost cricket game in the country as well.